College scholarships for the wheelchair confined: Health and fitness speaker. College scholarship & foundation grants for the wheel chair confined. Public speaker offers a health & fitness message. Wheel chair Success Foundation offers college scholarship / health and fitness. Welcome to The Wheelchair Success Foundation website. The Wheelchair Success Foundation (WSF) is dedicated to providing scholarships to people permanently confined to wheelchairs. Every life has value. A disabled person, such as one confined permanently to a wheelchair, is not exempt from earning a college education and contributing to the growth of America. 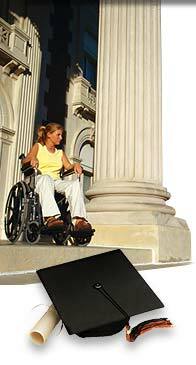 Persons permanently confined to wheelchairs are no less able to be college students or citizens. At the WSF, we help individuals permanently confined to wheelchairs earn college educations, or technical trades, after graduating high school or completing an equivalent GED. We want to empower and motivate each individual to reach his or her full potential. All great accomplishments begin with desire and the will to succeed. Everything worth having takes discipline, practice and hard work. By requiring our scholarship recipients to take a 9-hour course load and maintain a minimum 2.5 GPA, or its equivalent, we hope to inspire and motivate our beneficiaries to embark on an educational journey that will ultimately be enjoyable and worthwhile. We urge everyone to identify experiences that motivate them to take action toward the realization of their goals. This is vital to reaching peak performance level. Genetics, abilities or disabilities do not matter near as much as a positive attitude, personal determination and desire to reach your goals -- and Never Give Up! An impeccable Board of Directors, Executive Director, and Staff administers the WSF. Working with integrity, honesty and dedication, we guarantee every applicant will be treated fairly. "Education was, and continues to be, a major force in my life. Education is so important to me, because it is the foundation for all my accomplishments. Going to college has shown me what courage, perseverance and determination really meant. In all my endeavors I continue to use the self-confidence gained from excelling in school. It is my desire to help all people excel in their life endeavors. I want to help other wheelchair bound individuals gain from education through the Wheelchair Success Foundation. "Donations from great people like you will help the WSF grow and help more wheelchair-bound individuals gain the education they deserve. You will help them to prosper and be thrilling contributors to our society. So whether you're visiting this site to donate or to apply for a scholarship, thank you for visiting. "Please help the foundation grow with an online donation. Or see if we have a college scholarship that can help make a difference and create a more promising future. Don't let the fate that has left you or a loved one confined to a wheelchair hold you back from achieving your dreams." ©copyright 2019 Wheelchair Success Foundation.